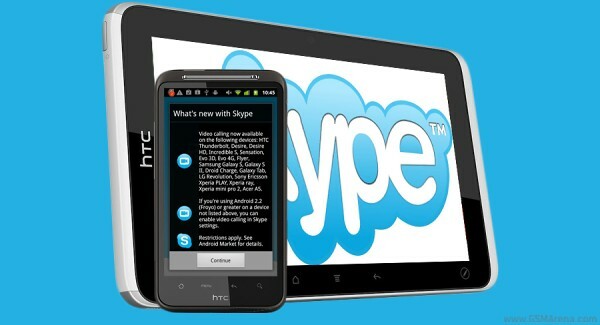 Skype has just added video calling support for an additional 17 popular droids with its latest ver. 2.1 for Android. Some of them are the HTC Flyer slate, Samsung Galaxy S II, the Xperia PLAY and more. The minimum requirement you have to cover is Android version 2.2 (Froyo) or above and even if your device isn’t blessed to be in the list of newly supported droids you should be able to enable video chat through the app’s settings. Keep in mind that this will allow only rear camera video calling and you’ll need 2.3 Gingerbread and beyond to enjoy true front-facing camera chat support. Apart from video-calling support, the new update brings a number of bug fixes and a performance boost. Here’s a direct link to the app and the full list of devices that will get the special treatment. In other news, after dishing out the Skype app for the iPad and the update for the Android app Skype is focusing its attention to bringing new skills to its Microsoft Platforms team. It’s put out a job offer for engineers to work on “for building and optimizing the Skype Video Engine solution for Microsoft Windows and Windows Phone platforms”. Here’s the ad itself if anyone’s actually interested. By this we gather that Skype is looking to enhance the video-calling experience on Windows and WP7, which will bring true cross-platform video communication.